Aileen of Ail + El, Dublin. Handmade concrete designs by Ail + El, Dublin. Homeware designs by Ail + El, Dublin. Concrete designs by Ail + El, Dublin. Succulents ready to be placed into the concrete designs by Ail + El, Dublin. Aileen of Ail + El homeware designs, Dublin. This week I had the fantastic opportunity to meet with chic homewares designer Aileen Balfe of Ail + El in Dublin. Gorgeous just doesn't quite fit her creations ... more like captivating and delightful. Her succulent planters and coasters in bright and contemporary designs are eye catching, fresh and vibrant. This is a clever homeware designer filled with optimism and fun and it shows through her work. I'm instantly impressed and at once strangely fond of Aileen Balfe of Ail + El. She welcomes me into her quintessentially cute cottage in Dublin for scones and tea served in pinterest-perfect teacups. I forget that I'm supposed to be interviewing her and we chat like old friends. As a Mum and self employed designer her days are organised and constructive. Her tiny shed is packed with bags of concrete, moulds and paints. Her kitchen window is filled with miniature succulents ready to deliver to shoppers with an eye for design. Her infectious happiness is unapologetically evident in the patterns that she paints. Aileen's creative career is on a stellar path. She made her first concrete pots for succulent plants in 2013 and started to sell them at craft fairs. A month later her designs featured on the cover of Image Interiors and Living magazine in Ireland. In 2014 she made it officially her business. Plant pots and coasters, each handmade and painted with bold designs and bright colours are her staples. I asked her where exactly she sold her designs. The list is long! Buyers come to her looking to stock her unique and quirky succulent pots. And an Etsy shop to boot. Succulents are a big trend globally and in Ireland now. Did she know that when she started out? "No! My suppliers are asking what type of plants I will use next as since I started out the craze has become so big." Each of her designs comes with a little succulent or cactus plant in it when she ships them from her Etsy shop or her website. Click below to follow Aileen of Ail + El online. Tell me a little about your background and what led you to this business? I studied interior and furniture design in college. After I graduated I spent a couple of years living in Japan and Indonesia. I studied textiles in Indonesia. So I have always had an interest in design. I was itching at the idea of starting a design business for a long time. A couple of years back I was collaborating with a friend, Eleanor McCaughey on a public art installation. We worked well together and this evolved into us experimenting with concrete and pattern and from there Ail+El was born. Eleanor’s background is in fine art so she has since gone on to concentrate on painting and I have continued to run Ail+El solo. What steps have you taken to market and grow your business since you set it up? We were lucky to initially be spotted by the editor of Image Interiors and Living Magazine and what was supposed to be a tiny feature turned into a front cover exposé and it all went from there. Since then we have continued to grow the brand and increase stockists across Ireland and have taken part in the Showcase tradeshow. Is it a love of plants or a love of design? Design is definitely number one. I love pattern and colour. 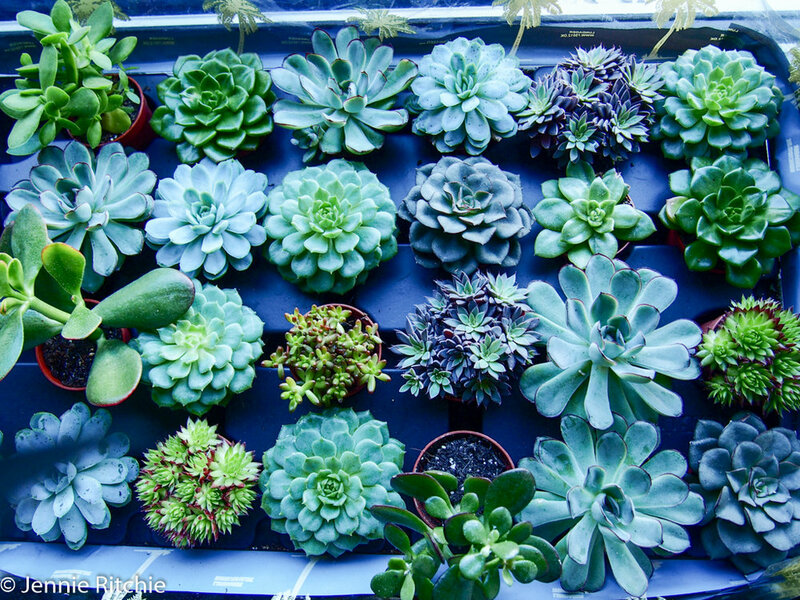 Although I do have a soft spot for plants, especially succulents and cacti. How did you feel when you sold your first piece? Very excited! It was at an outdoor Christmas market and it was absolutely freezing but when people started buying I forgot about the cold!!! What parts of the process do you enjoy the most? I love creating the patterns on each piece. Sometimes I get caught up in it and spend more time on the patterns than I should. Do you listen to music while you work, if so, who / genre? Each of the concrete pieces is unique they all have different patterns – I don’t use stencils on concrete. These patterns are all created whilst listening to music. So it’s a big influence. You have to be in the right frame of mind to create a good pattern so music helps! I listen to alternative music. My favourites would be Arcade Fire and Phoenix. I also like to listen to the radio for the news and current affair talk shows! What other creatives in Ireland do you admire? I love the work of Wild Cocoon. She creates beautiful woven throws and scarves and has worked really hard to establish a fantastic brand over the last couple of years. I also love the work of ceramist Andrew Ludwick. His patterns and use of colour are beautiful. I could be here all day listing creatives! Where do you seek design inspiration, online / books / places / etc.? I like to seek out inspiration from wandering around Dublin. I like to look at contemporary architecture, graffiti, and street art. I’m also a big fan of Pinterest! Where are your products available for sale? I have stockists all across Ireland (see below) and they are available to buy worldwide through my website. Where are your favourite hangouts on a Friday night? Since I’ve become a mammy my favourite Friday hangout is on the couch with Netflix! To be honest I don’t really read blogs anymore. I’m more of an Instagram addict!!! Best restaurant / café / food venue? Oh I love Brother Hubbard’s on Capel Street. Their Middle Eastern food is delicious. I also love the café at the Chocolate Factory. Great food and loads of space. Another favourite spot not far from where I live is the Café in the Ashtown Visitor’s Centre in the Phoenix Park. 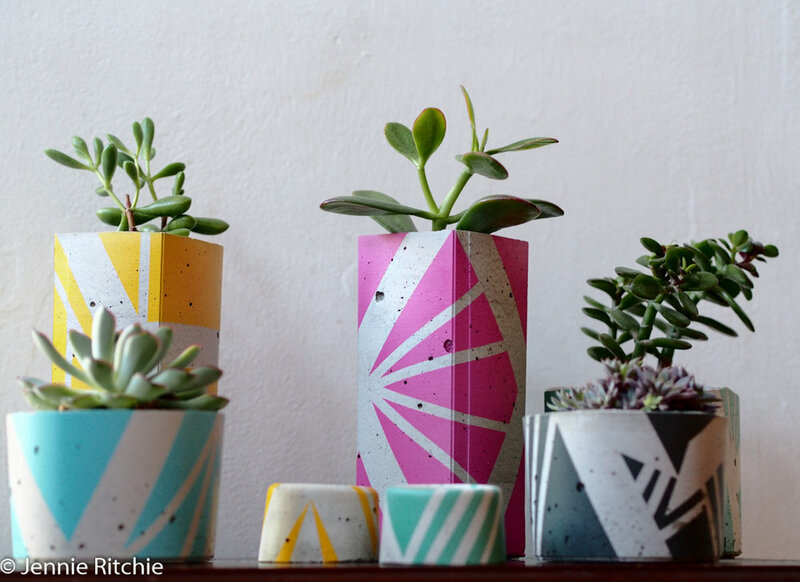 Thanks Aileen for this great insight to your über gorgeous succulent pots and concrete coasters! The Glucksman Gallery, University College Cork. Ph. 021-4901844. Laura Vaughan Design Studio, 89 O'Connell Street, Ennis. 087-9216252.